Turkey has threatened to scrap a critical deal on halting the flow of migrants to the European Union amid a spiralling war of words between Ankara and the bloc. This threat comes as many European countries have blocked the bids by Turkish ministers to address Turkish citizens in these countries to urge them to vote “yes” in the April referendum on constitutional changes. Turkey’s EU membership application has been pending for three decades now. What is the recent trouble in the Turkey-EU relations? Turkey has threatened to scrap a deal with the European Union to stop the flow of migrants into Europe as a row over Turkish campaigning in the Netherlands escalated into a full-blown crisis. There has been dramatic escalation after the Netherlands prevented two Turkish ministers from holding rallies ahead of next month's referendum on strengthening President Recep Tayyip Erdogan's powers. In reciprocation, Turkey halted all high-level political discussions with the Netherlands, told the Dutch ambassador not to return for some time, demanded an official apology, and summoned the Dutch charge d’affaires to the Turkish Foreign Ministry for the third time since March 11. The rallies are meant to drum up Turkish nationalism and patriotism ahead of the April referendum intended to increase the powers of the president — a referendum for which Turkey has been trying to campaign in the Netherlands, Austria, Germany, Denmark and Switzerland – all of which have large Turkish immigrant communities. All the countries have cited security and other concerns as reasons not to allow Turkish officials to campaign in their countries. But with as many as 1.4 million Turkish voters in Germany alone, Erdoğan cannot afford to ignore the foreign electorate. On Monday night, Turkish Deputy Prime Minister Numan Kurtulmus said that the European Union had not kept up its side of a deal whereby Turkey worked to help halt the flood of Syrian refugees into Europe, in exchange for aid and a shot at visa-free travel. He reportedly said that means the deal is dead. The European Commission has however said it remained committed to the deal and expected Turkey to comply as it was in their mutual interest. The dispute risks harming Turkey's entire relationship with the EU, which it has sought to join for the last half-century in an agonisingly slow process. Why is Turkey not happy with Europe? Turkey has aspired to European Union membership for decades. That ambition has foundered over questions raised by some European leaders in the past about a Muslim nation joining the club – doubts compounded by Turkey’s backsliding on a host of democratic norms and Erdoğan’s authoritarian tactics. While European countries routinely air grievances over Turkey’s moving away from the EU and neglect of human rights, Turkish leaders complain of European hypocrisy, its meddling in Turkish affairs, and its turning a blind eye to the activities of Kurdish separatists. The fact that members of (what Turkey calls) terrorist groups, including the Kurdistan Workers’ Party (PKK), have been freely speaking at conference venues and on public squares across the continent, while the same government shut the door on Turkish politicians citing security concerns, makes Turks believe that they are being treated like the enemy. To Turkey, the imposed ban on Turkish politicians’ campaign, seems like Europeans have sided with the "no" campaign ahead of the April 16 constitutional referendum. Also rankling Turkey is what it sees as unfulfilled EU promises regarding visa-free travel for Turkish citizens, as part of a deal in which Turkey virtually stopped an exodus of migrants into Europe via Turkey from Syria and elsewhere in early 2016. When was the refugee deal struck? The EU-Turkey refugee deal, struck in March 2016, aimed to curb irregular migration through the Aegean Sea by taking stricter measures against human traffickers and improving the conditions of nearly three million Syrian refugees in Turkey. Essentially, it said that irregular migrants who came to Greece from Turkey would be sent back. For every Syrian refugee returned to Turkey, a Syrian would be resettled from Turkey into the European Union. The deal also promised renewed talks on Turkish accession to EU; visa liberalization provided certain conditions were met by Turkey; and a substantial aid package from the EU to Turkey. Turkey did stop, or at least slow down, the flow of migrants from Turkey to nearby Greek islands, said Jeff Rathke of the Center for Strategic and International Studies. But refugee numbers were shrinking, anyway, since migrants couldn’t advance farther than Greece, thanks to the closure of the Balkan route. Within the framework of these agreements, last May, the European Commission invited the European Parliament and the Council of the EU to lift visa restrictions for Turkish citizens if Ankara would have fulfilled the remaining conditions for the abolition of visas by the end of June. Progress on the issue has been held up by legal wrangling. Brussels says Ankara needs to narrow its anti-terror laws to meet EU standards, while Turkey says it needs the laws in their current form to combat multiple security threats. In Feb 2017, Ankara alleged that Greece has forcefully sent more than 3,000 refugees migrants back to Turkey in the past months violating the Turkish-Greek readmission agreement and the EU Turkey Deal. According to Turkish officials, the migrants were sent back to Turkey through the Evros River (Maritsa in Bulgarian, Meric in Turkish), the natural border between the two countries in the north. 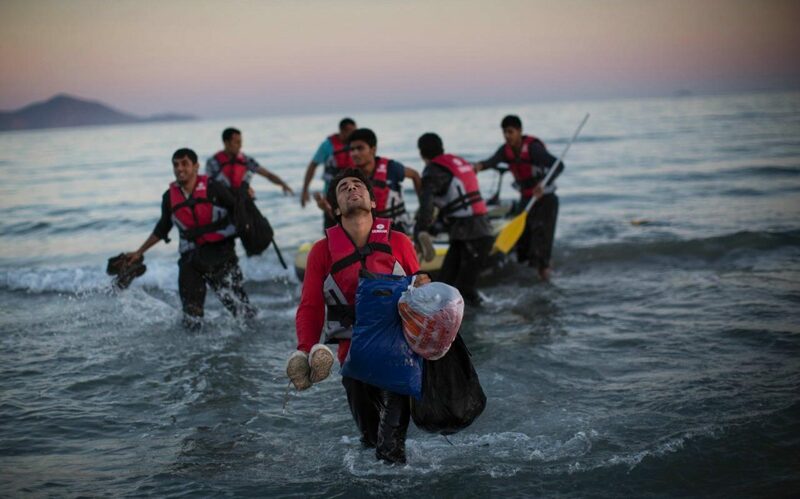 Turkish news agency Dogan reported, furthermore, that the migrants were tortured by Greek police officers who also seized their personal belongings before putting them on boats and pushing them back to where they came from. According to the Turkish Office for the Prevention and Elimination of Consequences of Emergency (AFAD) there are currently 3.5 million Syrian refugees in the country. Turkey spent more than $10 billion on their maintenance. Where are the reasons for Turkey not being a member of the EU yet? Turkey’s application has been languishing since 1987, when Ankara first asked Brussels to consider its case for joining. It was not officially recognised as a candidate until 1999. That was 18 years ago. Since then, things have not gone well. Formal negotiations did not begin for a further six years, and when they did they rapidly got bogged down – which is how matters broadly stand now. Aspiring members must adopt existing EU rules and standards. They do so in stages, a process that involves agreeing separately to each of 35 chapters. After nearly 30 years, only one negotiating chapter has been agreed with Turkey. Fifteen are, in theory, open for discussion, while talks about the remainder – the most difficult bits, such as freedom of movement – have not even begun. The main reason why matters have proceeded so slowly is that the EU’s big beasts, France and Germany, do not want Turkey to join. Hardly anything happens in the EU without the agreement of these two founding members. Nicolas Sarkozy, the former French president, was the first to put the boot in, and others followed. Almost the first thing Sarkozy did after he was elected in 2007 was block talks with Turkey on the key area of economic and monetary policy. Sarkozy argued that Turkey was geographically not part of Europe and had no place in the EU. François Hollande, Sarkozy’s successor, is similarly unsympathetic. More importantly, perhaps, Angela Merkel, Germany’s long-serving chancellor, also opposes Turkish membership. She repeated this view in a television interview in October last year. “Erdoğan knows this,” she said, referring to the Turkish president, Recep Tayyip Erdoğan. The EU is also suffering what is known as “enlargement fatigue”. Many European politicians feel 28 member states is more than enough. New members are not welcome from any quarter – and all 28 national parliaments have a right of veto. The focus of Erdogan currently is to drum up support among Turks living abroad for the April 16 referendum, which Berlin and other European capitals see as an increasingly authoritarian tone from Turkey. Analysts are predicting a tight outcome to the April 16 referendum on a new constitution and Turkish ministers have planned major rallies in key EU cities. The Netherlands is home to some 400,000 people of Turkish origin while Germany has 1.4 million people eligible to vote in Turkey - the fourth-largest electoral base after the cities of Istanbul, Ankara and Izmir. Faced with an upsurge in support for the far-right, European governments have come under pressure to take a hard line on Erdogan, who is accused by critics of seeking one-man rule in the constitutional changes. The refugee deal threat by Turkey may simply have been restating a long-held Turkish position that the deal will die if there’s no movement on visa liberalization. For Europe, the deal is important as it has helped reduce influx of hundreds of thousands of migrants to the continent. Turkey, too, would feel the impact of the end of the deal, since it would also mean the end of billions of euros in aid to Turkey. So neither of them would want the deal to come to an end, but it is being used as a bargaining chip by Turkey. How helpful has the Turkey-EU deal been for the refugees? A year after a controversial deal between the EU and Turkey blocked the flow of asylum seekers into Europe, tens of thousands are stuck in camps and suffering from rising levels of trauma and depression, aid workers have warned. Suicide is also on the increase among the refugees and migrants trapped in detention centres in Greece and the Balkans, as they despair about their future. Since the Balkan migration route was closed in early March last year and the EU-Turkey accord drawn up a few days later, around 62,000 have been left in limbo in Greece, 14,000 of them on the islands of the eastern Aegean, where they arrived after crossing by boat from Turkey. A further 8,000 asylum seekers are stranded in Serbia. Psychologists from Medecins Sans Frontieres (MSF), the international medical organisation, documented a 2.5 fold increase in the number of refugees suffering from anxiety and depression and a threefold increase in the number of people with post-traumatic stress disorder between the start and the end of 2016. In a report released on Tuesday, MSF teams said they are witnessing an increase in suicide attempts and cases of physical self-harm. As well as mental distress, asylum seekers who are stuck in the Balkans have reported being beaten up by police and border guards, bitten by police dogs and repelled with tear gas and pepper spray. The “one in, one out” deal was hailed as a breakthrough in the migration crisis, but a year on less than 1,000 migrants and refugees have been sent back to Turkey. Just over 3,500 refugees have been resettled from Turkey to the EU, out of the three million refugees hosted by Turkey. Less than 10,000 refugees have been relocated from Greece to other EU countries. “The EU cannot hail the policy a success as people are trapped in dangerous areas outside of Europe unable to flee, forced to travel via more dangerous routes or trapped in overcrowded and dangerous ‘hotspots’ on the Greek island,” an MSF spokeswoman said. But the refugee deal was only dealing with a symptom, not the underlying problem, David Phillips, director of Columbia University’s Program on Peace-building and Rights, said.